One of the increasingly important issues of todays world is the sustainable treatment of the environment. Aware of the potential long term dangers of pollution, customers as well as corporations seem to be increasingly interested in ways to act responsible and are looking for ways to reduce their environmental footprint. Obviously, areas like window display, visual merchandising and store fitouts can not entirely be left out in this regard. 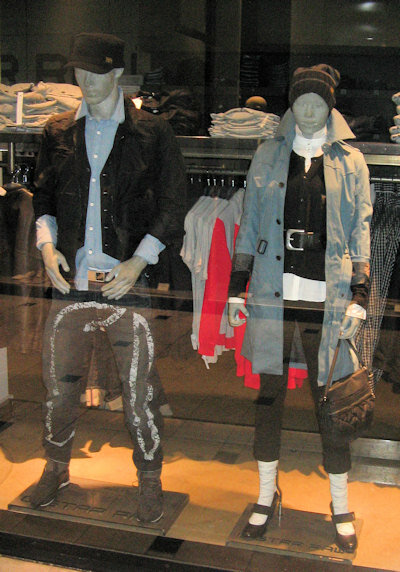 Today, most of the mannequins in usage are made out of glass fibre for example. Glass fibre is composed out of polyester or expoy resin combined with a hardener and fiber glass. Although glass fibre is a material with many advantages, it is not possible to recycle this non-biodegradable material in its polymerized form with todays technology. Consequensially, most of todays mannequins have to be disposed of either by throwing them into landfills (forbidden in Germany since 2005 due to the high content of organic matter) or by burning them in waste incinceration plants. All in all, this approach isn’t very eco-friendly. So, driven by the awareness of the potential environmental impact of their own activities, responsible corporations and merchants are looking for alternatives. There are several available on the market. The main development path for the production of mannequins seems to be the increasing usage of polyurethane resins, which can be recycled and are far more eco-friendly, but also more expensive compared to the traditionally used polyester resins. Also, for smaller display objects like hands, heads, legs and headless torsos recycable materials like cardboard might be used. For complementary equipment like coat hangers there are also greener alternatives. For example, hangers made out of solid wood or plastic may be gradually replaced by coat hangers made out of rapidly growing bamboo, saving trees or avoiding the usage of products based on oil. All in all, there are green alternatives responsible merchants may choose, especially if those alternatives are priced competetively. If you are looking for suitable wigs to equip your mannequins, we recommend wigs-direct.com, an online retailer with a great assortment of wigs.